On March 4th Kenyans went to the polls to elect a new government to steer the country over the next 5 years. One of the candidates, Mr. Uhuru Kenyatta, who subsequently won the election with his Jubilee Coalition, had made a daring campaign promise that many wondered if he would deliver on – to equip every student starting their primary school education with a laptop. So far the plan involves a three-phase approach, with the first one targeting pupils in 6000 schools starting January next year. The project has drawn many views, mostly skeptical, of the undertaking from all quarters – teachers, parents, the technology community and the larger public. All the same, Mr. Kenyatta has stuck to his guns on the implementation of the laptops project and provisions have even been made in the country’s budget to this effect. All the while, the practicality and relevance of the project remain in question among many. So does Mr. Kenyatta’s project hold water, or will it turn out to be a white elephant? Let’s examine the situation. Timing: It’s just not the right time for such an initiative. There are other pressing matters that can be dealt with instead of ‘throwing away’ money in an impractical project. How about jobs, healthcare etc.? And even if it is a matter of enhancing education – why not first hire more teachers, there’s clearly a shortage of them, or pay teachers better? But wait, has this been tried elsewhere with a similar context? Yes! 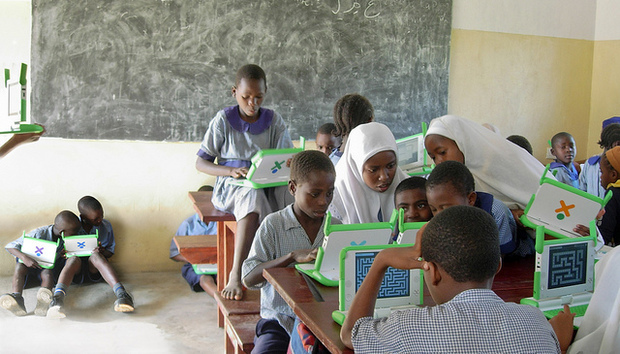 In fact a laptop-for-pupils initiative has been attempted by the One Laptop Per Child (OLPC) initiative in Kenya. Students in primary schools in West Pokot (2010), Meru (2009) and Kibwezi (2008) were involved in projects that introduced the OLPC device to students. (Also take a look at the 2002 Computers for Schools in Kenya (CFSK) project targeted at secondary school level). On a national scale, Rwanda has a thriving program whereby children in primary school are exposed to technology via laptops, which provides a good learning case for us. In 2000, Rwanda embarked on a 20-year journey under the 'Vision 2020' banner. Among the goals of the Vision 2020 is to transition from an agriculture-based economy to a knowledge-based economy. Education sector reform has been identified by the Rwandan government as a key piece to the puzzle in making this dream come true. As such the government took several initiatives in the education sector to realize the vision. Amongst these initiatives is the ongoing OLPC project that envisions placing a laptop in the hands of millions of schoolchildren. However, before we can briefly shed some light on the Rwanda OLPC project and the progress that has been made since 2009/10, when the project got underway. It is worth noting the broad and encompassing approach the Rwandan government has taken. It's really not so much about placing a laptop in the hands of every schoolchild as it is about this being a strategic piece in a grander strategy to achiever a grand goal – namely, the total conversion of Rwanda. As such, it's just as much about broader educational reform (e.g. curriculum and content development, check out their Rwanda Education Commons initiative) infrastructural development (from building classrooms to connecting them to the grid), and knowledge/skills transfer & capacity development. And how has the Rwanda OLPC faired so far in the roughly two years that the program has been operational: over 200,000 laptops in over 400 schools, 10,000 teachers trained, many new classrooms built and a ton of content developed. (It's worth noting that Rwanda targets 4th – 6th graders as opposed to Kenya's targeting of 1st graders). In fact Rwanda's initiative is a first in Africa and third largest implementation of a 1-to-1 computing in public schools program. In other words, Rwanda's goal of putting a laptop in the hands of every schoolchild is more of a means rather than an end in itself. I would compare this to the United States' mission to the moon, the Apollo Program under President John F. Kennedy. Apollo was about putting a man on the moon, but it was really more than that (at least in retrospect). The Apollo Program left a legacy science and engineering - for instance, key research into integrated circuits, the first-time development and use of key technologies – as well as a cultural legacy – how many young Americans dreamed of being astronauts when they grew up and thus pursued math and the sciences with passion? This should be the same view Kenya should take to her endeavor. Seeing a bigger picture. Of course seeing the big picture is one thing, communicating it and getting all stakeholders on board is quite another – think of the people who thought Apollo was a waste of taxpayers’ money that could have been better spent on other causes (the same criticism many scientific endeavors encounter). In an article on the Wall Street Journal, President Kagame states, “There is a view that development is a marathon, not a sprint. We do not agree. Development is a marathon that must be run as a sprint.” I'm not sure what he meant but what is evident is that the problem of education reform is a grand issue, one that calls for well thought out approaches and solutions. Perhaps according to Mr. Kagame, the marathon part is figuring out the right strategy, and once that's identified then sprint to the finish line. From researching the Rwanda case it is clear that there is a comprehensive strategy in place, just take a look at the Rwanda OLPC Wiki page, or browse through their Facebook and Twitter timelines. Perhaps the greatest failing of the Kenyan government from the start of this project has been the lack of communication of what the plan really is, in a comprehensive manner. Instead, from the outset all the information being given amounted to more or less one sentence “We're going to give free laptops to primary school children [as soon as we are in government]”. What? How? Why? This single factor has probably been the greatest contributor to the skepticism & resistance the government has received to this project. Maybe they had a good plan, but without communicating it, people were left to speculate. Finally, the country should avoid putting the cart before the horse. Technology – laptops vs. tablets vs. computer laboratories, Microsoft vs. Open Source – is not the main thing. The key outcome is relevant, practical education for the student. Let's not lose sight of that. Therefore, the government should not appear to be pushing this idea down our throats; all stakeholders should be involved – teachers, parents, the technology industry, even the students themselves – why not? Kenya should consider going next-door to learn from Rwanda's experience and borrow best practices. After all, it seems the new Kenyan Senate is eager to learn from their counterparts in Rwanda, so let's be humble and learn in other areas as well. Furthermore, the country should strive to seek multiple solutions to the education problem. Private enterprise can do a great deal to help remedy the situation and there are already several initiatives out there – Kytabu, Eneza Education, eLimu, just to mention a few. The Ministry of Education should also work to give strength where it can to these initiatives and even co-opt them. Hopefully Kenya's laptop-for-pupils will (if nothing else) draw serious attention to the issues of education and the education system in a way that will create the impetus to seriously tackle the problems – both from NGO, public and private sector players.